Terra cotta urns in Andrew Bunting’s vegetable garden. Michael and I are longtime members of the Hardy Plant Society Mid-Atlantic Group, a wonderful organization, which you can join for only $25 per year. One tremendous benefit is the chance to go on the Fall Members’ Garden Tour, which took place this year on September 6 in Swarthmore and Media, Pennsylvania, US. We toured six lovely and interesting gardens and then enjoyed a sumptuous feast with excellent wine at the Swarthmore Fire Company. 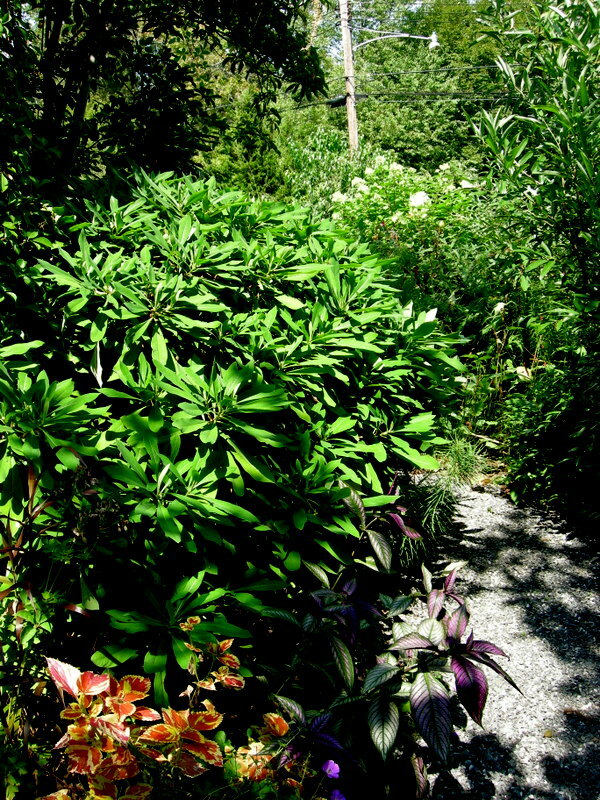 In this post, I will profile Belvidere, the home garden of Andrew Bunting, Curator of Plants at the Scott Arboretum of Swarthmore College. 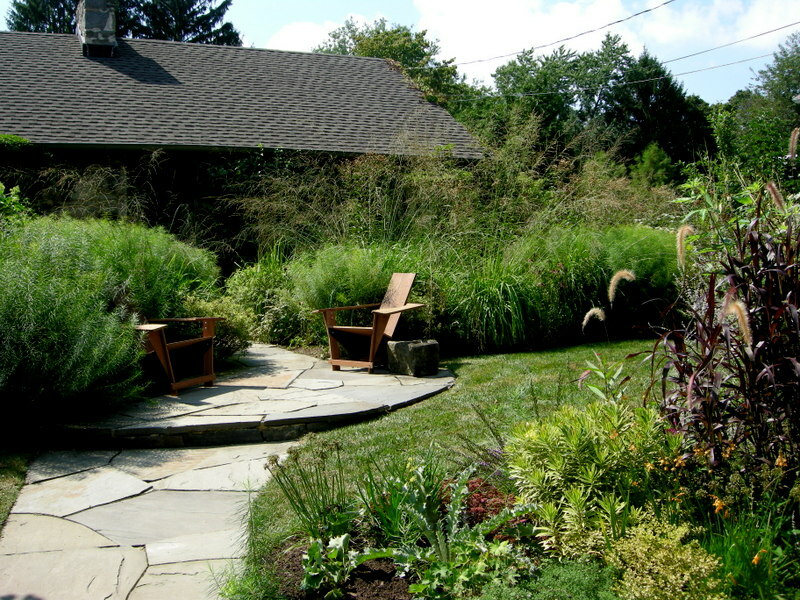 The front of the Bunting house is lushly planted with grasses, unusual shrubs, and vines. The path from the front to the back features this lovely, healthy edgeworthia. It seems that most established edgeworthias were not fazed by the horrendous winter. For more on edgeworthias, read my post by clicking here. 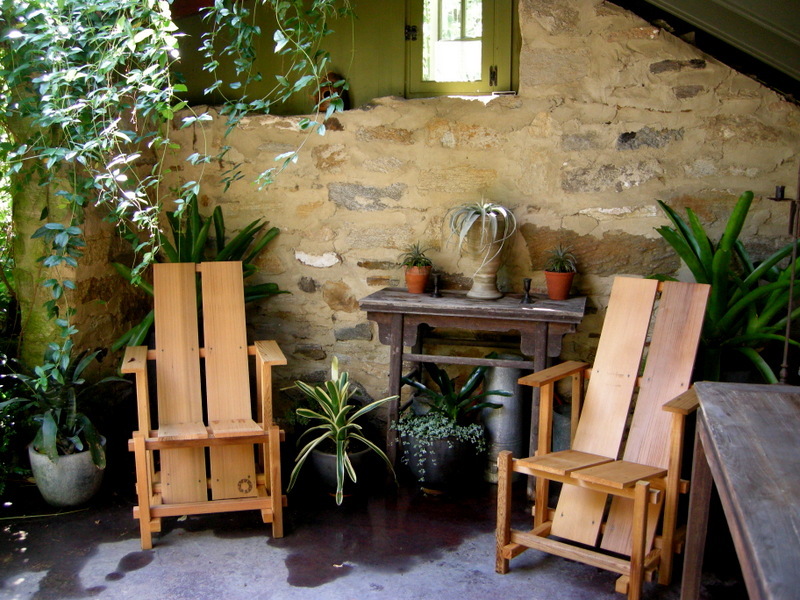 Behind the house is a large bluestone patio filled with tropical plants. It was very sunny the day of the tour, nice for viewing gardens but not so great for photographing them. There are many areas of this garden that I would like to show you but can’t because the photos didn’t turn out. 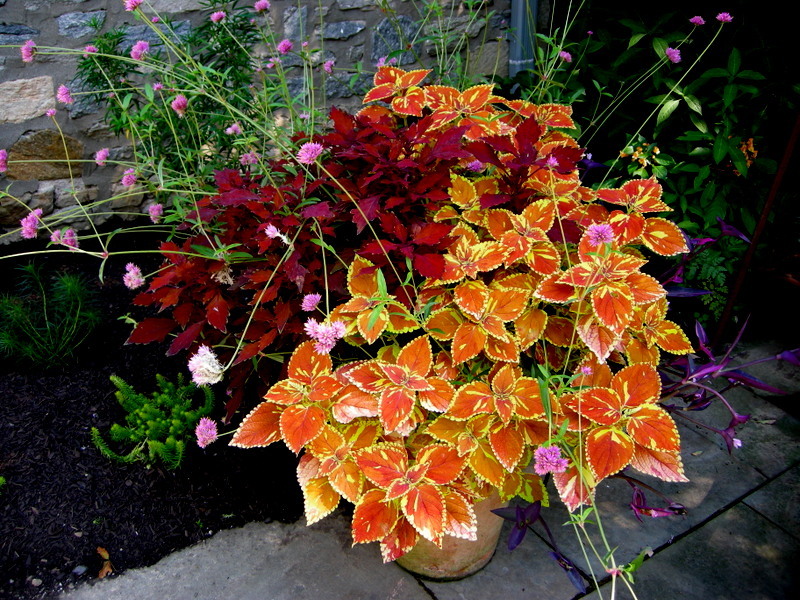 One of the containers on the bluestone patio, great color combination. Andrew converted the detached stone garage into a summerhouse. This is a seating area out front. 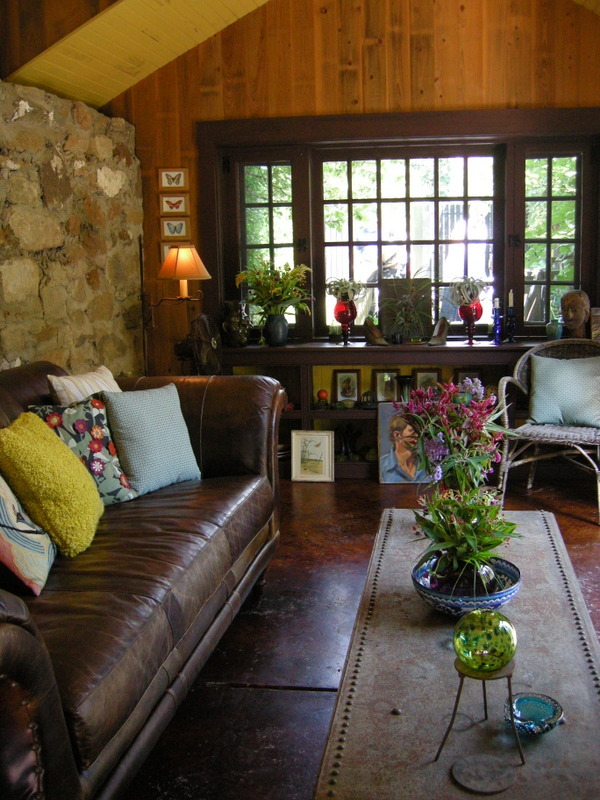 Inside the summerhouse—I want this room! Another room in the summerhouse where the outside comes indoors. Andrew is an expert on tropical plants, and they are all over his garden and also well represented at Scott Arboretum, which you should visit if you get a chance. The banana tree in the background started as a very small plant this spring. Andrew will cut it back and bring it in for the next two winters, but then it will get too big to store, and he will start over with a little one. 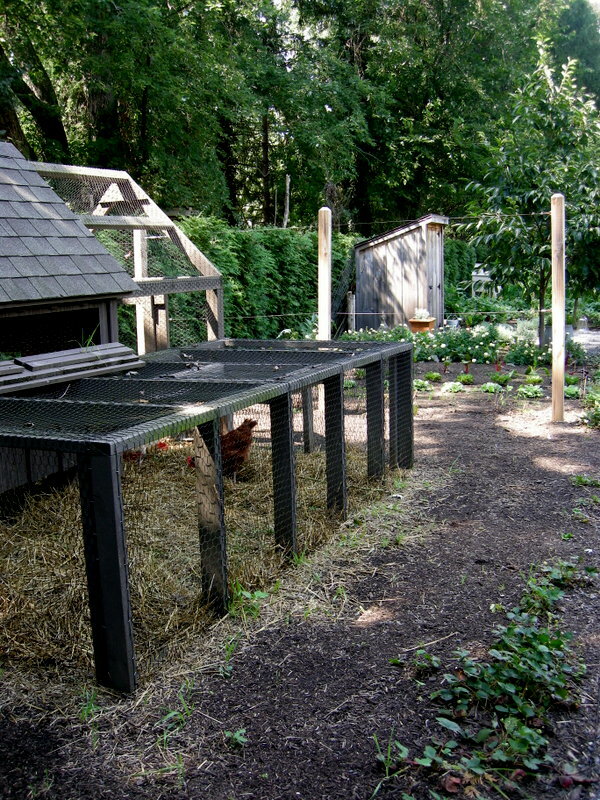 Andrew’s garden has expanded onto his neighbor’s property where he maintains a miniature polyculture farm complete with vegetables, fruit, cut flowers, chickens, and an immaculate composting operation. 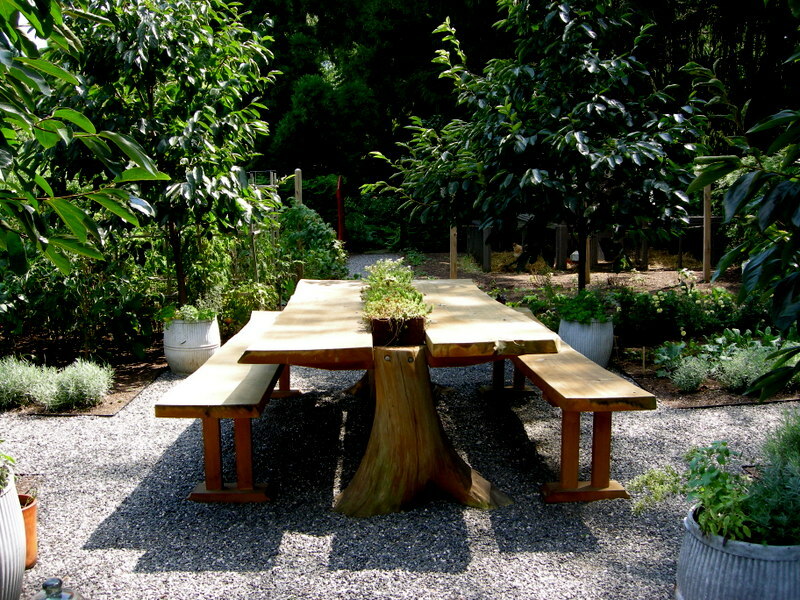 Farm-to-table is easy when you have a beautiful handmade table set in the middle of your edible garden. Notice the tree trunk supporting the table top. 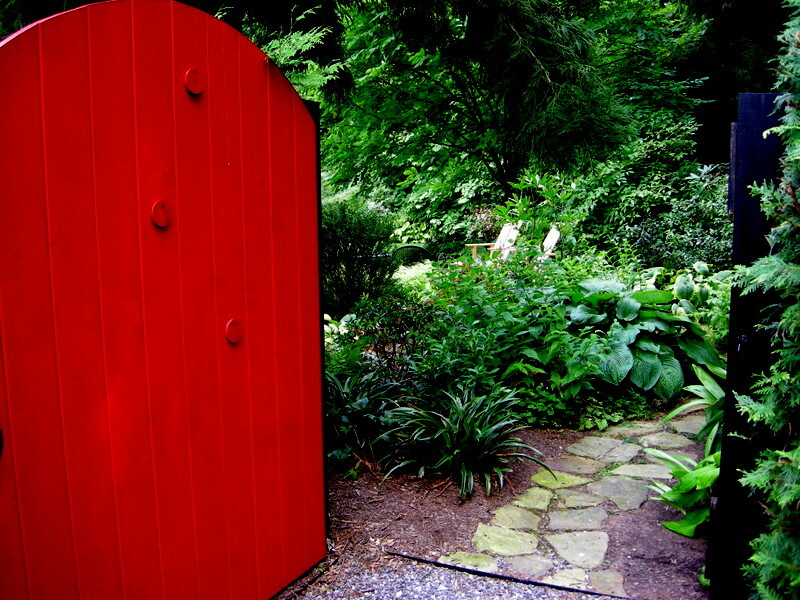 A striking red door leads from the vegetable garden to the densely planted woodland garden. The door has peep holes to create a secret garden effect for visitors of all ages and sizes. 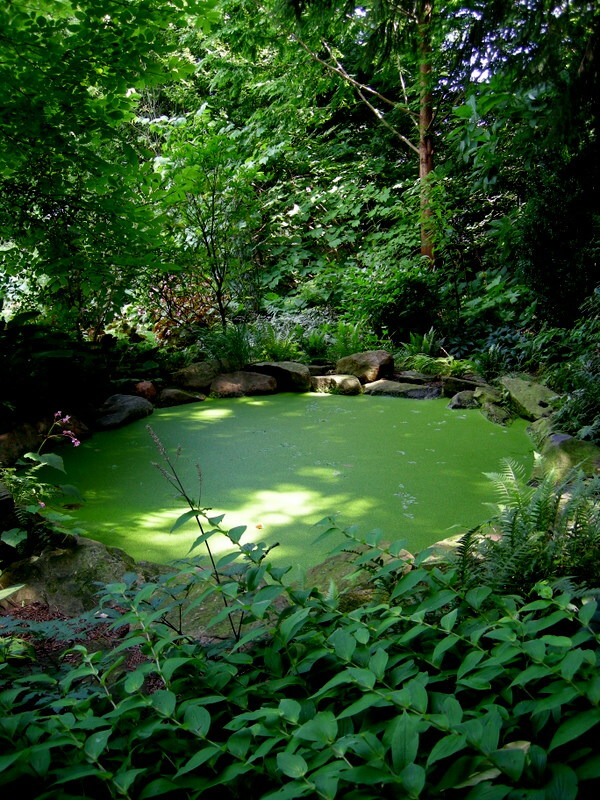 A pond in the woodland garden. 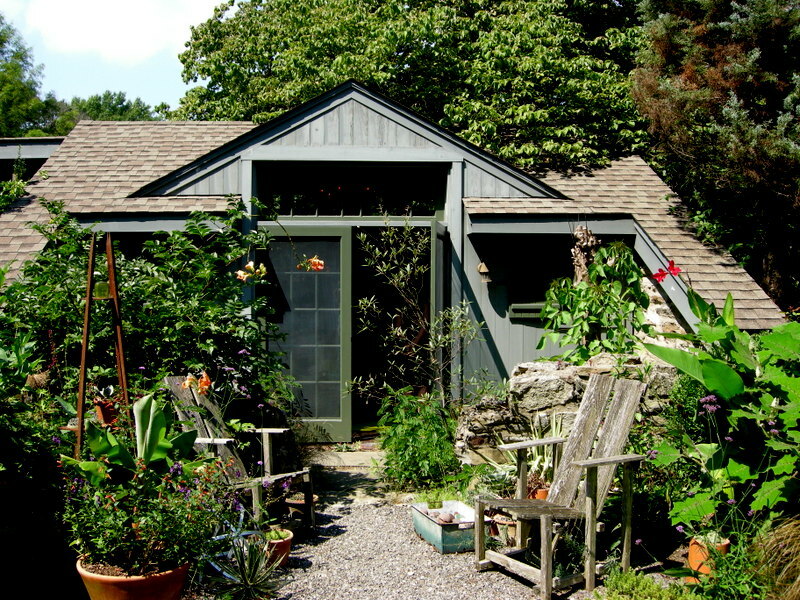 Although Belvidere is only 1/3 of an acre, the various garden rooms make it seem much larger. There is a surprise around every turn. A seating area in the woodland garden. 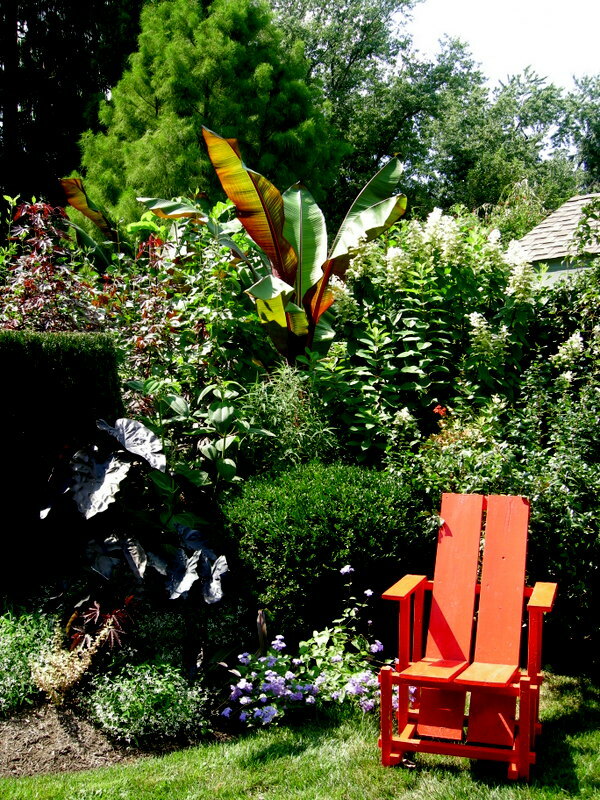 Almost all the chairs in Andrew’s garden were created by Dan Benarcik, who when he isn’t making gorgeous gardens as a horticulturist at Chanticleer in Wayne, PA (have you seen the Teacup Garden this year? ), designs garden furniture. To access his website, click here. The chairs are very elegant and surprisingly comfortable. This is an exceptionally beautiful and extraordinarily well maintained garden packed with plants, containers, furniture, hardscape, paths, and unusual garden features. This led Michael and I to question whether Andrew ever actually sits down in his chairs, we know we never do :-). Nursery Happenings: You can sign up to receive notifications of sales and events at the nursery by sending your full name and phone number to carolynsshadegardens@verizon.net. This entry was posted on September 30, 2014 at 12:48 pm and is filed under container gardening, Fall Color, garden to visit, Garden Tour, landscape design, Shade Gardening with tags Andrew Bunting, Carolyn's Shade Gardens, Hardy Plant Society, Hardy Plant Society garden tour, Hardy Plant Society Mid-Atlantic Group, Scott Arboretum, Swarthmore Pennsylvania, tropical plants. You can follow any responses to this entry through the RSS 2.0 feed. You can leave a response, or trackback from your own site. Oh where do I begin…the summerhouse, pond, red door….absolutely an amazing peaceful space. 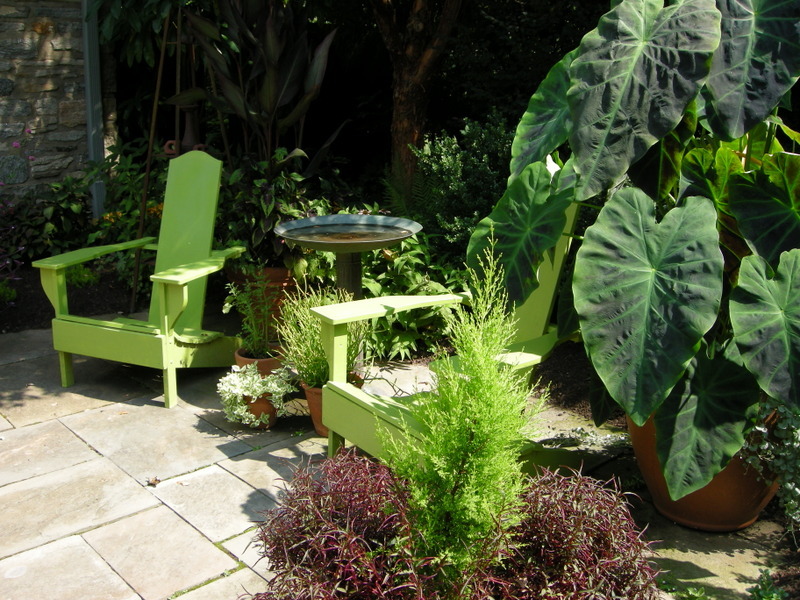 I do love surprises and it makes me think how I would love to make those in my garden….of course all the wonderful chairs I hope get some folks to sit and rest, reflect and find solace. That summer house–gosh, I sure would like one of those! The entire garden is neat and planned, but not in a “too perfect” kind of way. I can see that the overall effect is a welcoming, warm feel. Lucky you to have a home garden tour of this beautiful place. And thanks for sharing! 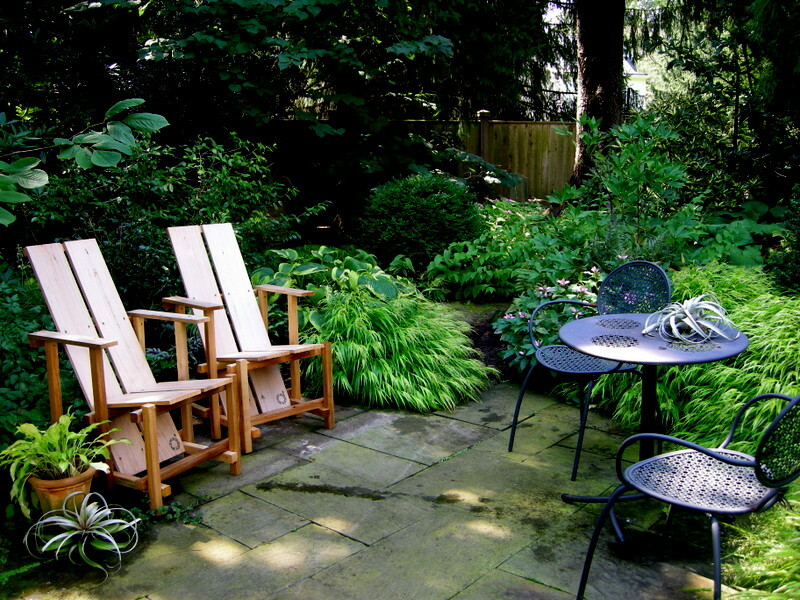 Such a beautiful garden…and I love those chairs. Like you, I wonder how a person with such a well maintained garden can have time to sit. Does he really maintain the garden all by himself? Thanks for taking us with you 🙂 . beautiful. I really need to get up out of my own garden seating and get to work, maybe I can at least make a dent in the weed population! This really is a little bit of paradise. A beautiful garden, thanks for sharing this inspiring post! This is an extraordinary garden indeed! Too much to comment on, except I must mention the lime green chairs, the summerhouse, the tree trunk table and the woodland pool! I was so glad that I was able to attend the Perennial Plant Conf. at Swarthmore, not just because I enjoyed the event, but for the fact I got to see the Scott Arboretum. I am sure much of what I was saw Andrew Bunting had a hand in. Yes, the most interesting private garden I have ever seen. I dream about it! I have changed my way of ornamentation since we stayed with Andrew and revelled in his garden for several days. 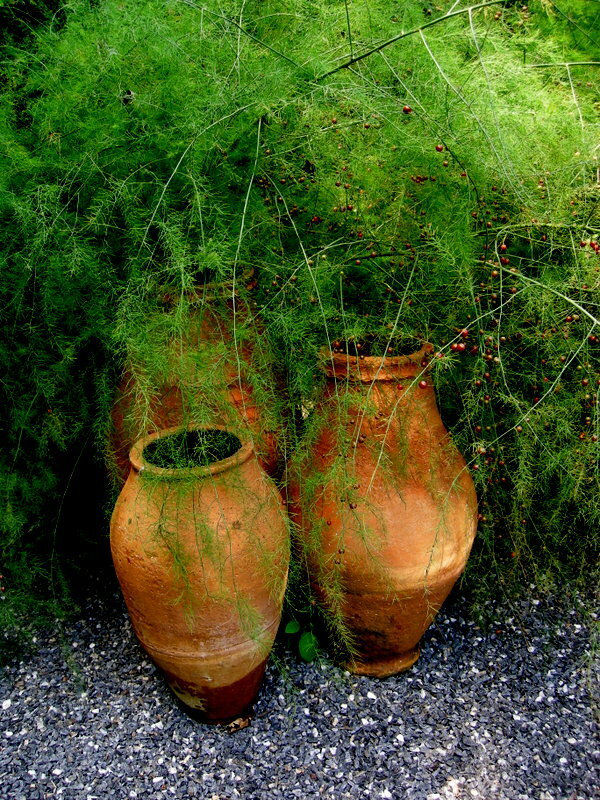 Carolyn, NZ gardens – get in touch with Bill Thomas at Chanticleer.